Repeatability and reproducibility are achieved by a controlled method of compaction. The sample cell in which the dry medium is placed is a precision cylinder. A plunger compresses the powder as the cell vibrates; the force of compression is selectable and, therefore repeatable from test to test. A preliminary compaction with only the displacement medium in the cell establishes a zero-volume baseline. 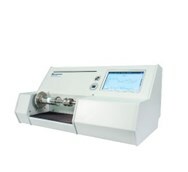 There are no threads in Micromeritics GeoPyc 1365 Envelope Density Analyzer Reviews at this time.